Tulare Regional Medical Center could have up to $22m more in its bank account, after the hospital’s Board of Directors voted to allow its management company to pursue a loan that the company says will be used on a combination of refinancing existing debt and funding for operations. The resolution was approved on 3-2 lines, with Linda Wilbourn, Parmod Kumar and Richard Torrez voting to approve the resolution, Kevin Northcraft and Michael Jamaica dissenting. Officials with Healthcare Conglomerate Associates (HCCA) — the company that the board has retained to manage day-to-day operations at the hospital — stated that there were no specifics on the loan’s length or interest rate, as the company would be approaching banks. The resolution also states that HCCA could seek loans of up to $22m, and Alan Germany, CFO for the company, stated that the hospital could spread that out across multiple loans or multiple banks, depending on which approach would be most advantageous. “We want [the banks] to compete with one another to get even better rates,” Dr. Benny Benzeevi, CEO/Chairman of HCCA, said. Germany also stated that the loan could be used to refinance bond debt at more advantageous interest rates, and that the meeting was scheduled as a special board meeting because the Federal Reserve was acting to raise interest rates. “If we don’t hurry on this, rates will go back up,” Germany said. The loan was presented as an opportunity to provide the hospital with a “good cash position,” and a cushion that would allow the hospital to participate more often in “intergovernmental transfers,” transfers in which the hospital sends money to the state and can make significant returns. 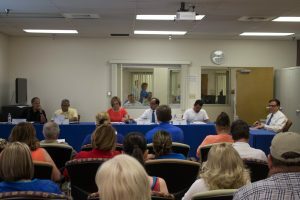 Because of the lack of detail, board member Kevin Northcraft proposed that the hospital allow HCCA to seek out lenders, but come back to the board for approval of any loan. Benzeevi stated that to pursue such a strategy would violate the board’s contract with the company, stating that the board would move from governance into operations — the area delegated to the company by the contract. He also stated that requiring the company to come back for approval would defeat the purpose of the resolution, creating a delay and potentially preventing the company from getting the best possible deal. “A comment like that could be a potential breach [of the hospital’s contract,]” Benzeevi retorted . After some discussion, Bruce Greene, an attorney that represents both the district and HCCA, was asked via telephone whether the idea would be a violation of the contract. “I’m not going to violate somebody’s contract,” Wilbourn said. Greene seemed undisturbed by the question. “All right, well, he made an amendment — so vote on the amendment,” Greene said. Benzeevi also revealed at the meeting that the company has extended interest-free loans to the hospital. The agreement between the hospital and the company allows HCCA to do so unilaterally, but also states that it may extend interest-bearing loans as well. HCCA may make interest-bearing loans to the District at any point the District has not been able to meet payment obligations to HCCA. “If the district is unable to fund things, we have the right but not the obligation to provide the funding, and HCCA has done that,” Benzeevi said. Northcraft asked Benzeevi whether the loan would potentially change anything about the hospital’s contract with HCCA, possibly referring to provisions that would allow the company to enter into an Interim Joint Operating Agreement or Joint Operating Agreement with the hospital district. “We’re moving along with the contract as planned, as agreed-to by the board, and we’re staying laser focused on that,” Benzeevi said. Both agreements were already signed and agreed to by prior boards. The company would also be able to purchase or lease the hospital, subject to voter approval, under the Option Agreement that the prior board signed with the company. The Joint Operating Agreement strengthens the partnership between the district and HCCA, and switches from a monthly management fee model to a profit-sharing model in which the “annual net operating income from the Hospital and other Clinics” would be split between the district and HCCA; the district would receive 5% of that income, while the company would receive 95%. During the course of the Joint Operating Agreement, 95 percent of operating income will be distributed to HCCA, and five percent to TLHCD. Among other items, the company would also set the “strategic direction and provide strategic and operating planning for the [hospital’s] Operations, creating a separate community board that would provide advice and input on the hospital’s operations. HCCA will also establish and select members of a “community board” to provide advice on the hospital’s operations. Officials did not make clear, and board members did not ask, whether the refinancing of the bonds mentioned would shift the hospital into the Joint Operating Agreement. Teresa Berbereia, a nurse who works at the hospital, spoke in favor of the loan. Kimberly Hughes, another nurse at the hospital, also spoke in favor of the loan. Deanne Martin-Soares, a prominent critic of the hospital’s management strategy and former board member, asked if the board even knew what the final uses of the money would be. Jose Sigala, a Tulare City Council member, spoke against the loan and the short notice of the meeting. Martin-Soares had requested that Tulare Mayor Carlton Jones appear to speak, but Jones was not in attendance at the meeting. Sigala also announced the same day that he had endorsed the recall of Dr. Parmod Kumar, and replacement candidate Senovia Gutierrez. Alberto Aguilar, another critic of the hospital’s management strategy and a former Bond Oversight Committee member, spoke to the board to outline his displeasure as well. “Let’s talk about the $800,000 loan, that was supposedly a line of credit,” Alberto Aguilar, of Tulare, said. The board previously voted to approve an $800,000 line of credit in September of 2016, in what hospital officials and board members represented at the time as a way to achieve a bulk discount from a vendor. It was later revealed that the line of credit went to repay past due invoices from November of 2015 to May of 2016. “When you ignore the wishes of the people and you go ahead and you do whatever the puppet master tells you to do, that’s ridiculous,” Aguilar said. Thank God Kumar will soon.ne gone and then the citizens will get their hospital back. Benseevi was talking over Kevin. Kevin had the floor and the chairperson did not call for a point of order. Kevin should have been allowed to talk till he was finished before being interrupted by Benseevi. Benseevi was condescending, rude and out of order. Also, why did the chair allow a citizen of Visalia to voice her opinion of the loan. More than a dozen Tulalre Citizens spoke out against the loan and only 3 HCCA employees spoke in favor of it. I thought the idea of community input was for the board to listen to the citizens and vote accordingly. A profitable hospital that has to use loan to keep lights on — and then they kill people !! Federal Reserve had meeting last week and raised its benchmark rate already — and they do not get to do another raise for another 3 months — AND have already announced that they will not be considering another raise until December 2017 mmeting. BUT, bigger part is that Federal Reserve DOES NOT set rates in market. Financial markets do. After last week’s Fed raise, interest rates in market have actually gone DOWN, not up. Kumar lied — People died. They are thieves and they are killers. >>> (Kim said) The loan is needed to finish this hospital, to give this community the hospital they deserve. This loan could “finish” the hospital. After this, the hospital is gone – finished. They will pawn 200 million property for 22 million loan from their friends and then choose to not pay, triggering auction — and then buying it for pennies on the dollar in auction. Tulare people so deserve the killing machine they have got. They did not watch what was going on and they have got what they deserve. One would hope that any “honest lender with integrity” would not get involved with this outfit. Sounds to me like the pack of three dictators are planning something possibly shady. FYI money lenders there is something more important than making a major loan just because you can …especially when there is no transparency and public discussion with the tax payers who will be saddled with this public debt. Also a word to Carlton, you are the mayor of our city and it would have been nice if you and the entire city council showed up together as a group. Citizens of Tulare are in a major fight to take back our hospital from HCCA and you should at least show some public interest. Thank you city councilman Jose Sigala for being at the meeting. Lies, Lies,and more Lies! When are the people of Tulare going to boot that Benzeevi for running that place to the ground. TRMC was a great place to work and a good hospital to go to. Then something happened many years ago and this Benzeevi guy showed up in the ER and it has been downhill ever since. That Benzeevi alienated all of the private practice doctors and now accuses them of filing complaints and taking their patients elsewhere. Do you blame them? The root of this whole Hospital mess can be summed up by looking at the history. Now you have this guy getting 300,000.00+ a month to manage this TRMC to the ground. Shame on him. The hospital doesn’t have two nickels to rub togather but the Great HCCA can borrow money without explanation and futher burden the taxpayers of Tulare. Its about time to run the “Dog and Pony” show out of town and let them join the circus elsewhere.The people of Tulare deserve a great hospital and bring the pride back to where it once was. Hopefully the recall of Kumar can help change things for the better. I worked there 30 years and it just sickens me to read all of the lies every week when I know that all TRMC has to do is remove the cancer that has destroyed your building! Thank you! Throughout my life I would tell people that Tulare had some amazing nurses that I would trust my life in their hands and you were always the top one on the list. Thank you Wojo for the ER memories along with others who left because of the mess. TRMC had one hell of an ER crew of nurses. I to would in trust my life to them, but not now. TRMC and the citizens deserve to better.